Immerse yourself in the beautiful and hypnotic soundworld of the viola da gamba in this solo recital by renowned gambist Laura Vaughan. Revel in the rich and unique sonorities of the instrument as it weaves a tale through different musical styles with rarely-heard works by Tobias Hume, St. Colombe, Carl Friedrich Abel and Johann Sebastian Bach as well as newly-discovered solo Fantasias for viola da gamba by Georg Philipp Telemann in the stunning surrounds of Montsalvat. Melbourne-based viola da gamba specialist Laura Vaughan is a dynamic and well-recognised member of the early music movement in Australia. Following her return from studies at the Royal Conservatory of The Hague, she has established an active performing career on viol and violone, encompassing a wide range of solo and chamber repertoire across Australasia. Passionate about the unique sound world of the viol, Laura is committed to bringing this exquisite repertoire to audiences around the world. She is also one of the few exponents of the rare lirone. 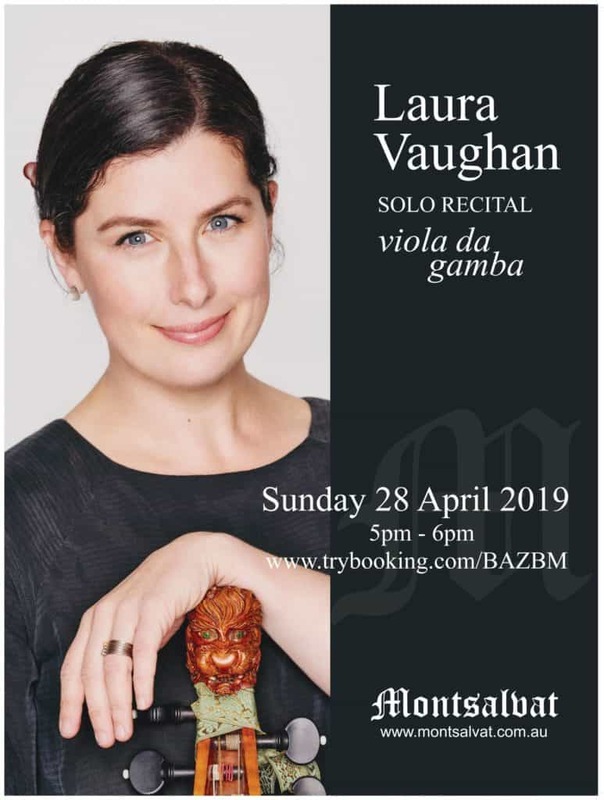 Laura can be heard regularly on ABC Classic FM as a soloist and chamber musician and appears on numerous CD recordings, including solo recordings for the Move and Paladino labels. In addition to solo performances, she works with many Australian early music ensembles including the Australian Brandenburg Orchestra, Orchestra of the Antipodes, Adelaide Baroque, Accademia Arcadia, Consortium and is a founding member of the multiple ARIA award nominated trio Latitude 37. Laura has appeared with Tasmanian and Adelaide Symphony Orchestras, and Auckland Philharmonia.